The Habonim trunnion mounted valve series is specially designed to endure the harsh conditions of the oil & gas and petrochemical industries. 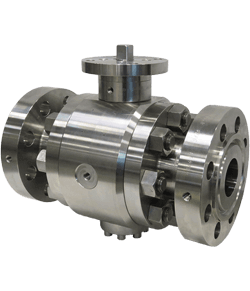 The robust design tolerates the heavy loads applied to the valve trim that result from of large sizes, high pressures and dynamic temperature cycles. The trunnion valve series is certified to API 6D (Habonim monogram #6D-1278) with a valve wall thickness that is in full compliance with ANSI B16.34. The complete line is fire safe, designed according to API 607, ISO10497 and API 6FA. 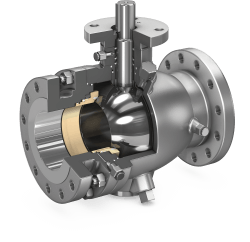 Up to class 600 Habonim offers a cost-effective solution consisting of a 2-piece & 3- pice solid cast full-port valve. With classes 900 (94 series), 1500 (95 series) and 2500 (96 series), Habonim uses a robust 3-piece forged design for body and ends. Temperature range -60 °C (-76 °F) to 260 °C (418 °F).